If the third baseman fields a ball and throws it to first, it is recorded as a 5-3 out. 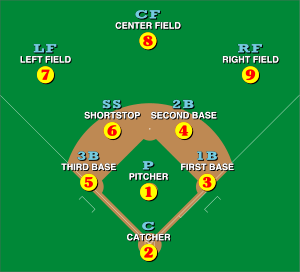 A double play where the second baseman fields, throws to the shortstop covering second base, who throws to the first baseman, is recorded as a 4-6-3 double play. This is not the only way to make a double play. Wikimedia Commons has media related to Baseball positions and Fielding (baseball). ^ Spatz, Lyle (2012). Historical Dictionary of Baseball. Scarecrow Press. p. 3. ISBN 9780810879546.